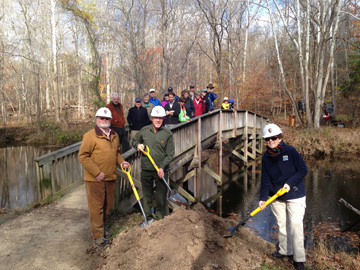 The C&O Canal Trust hosted a groundbreaking on Saturday, November 14, 2015 at 11:00 a.m. to officially launch construction on the new Marsden Tract bridge over the canal. Park Superintendent Kevin Brandt, C&O Canal Trust Board Chair Michael C. Mitchell, and Trust President Robin Zanotti participate in the ceremony. This bridge is funded by donors to the C&O Canal Trust’s Towpath Forever program, with a funding match from the National Park Service Centennial Challenge Program. It is the first project to take place in the Park in honor of the National Park Service’s 100th anniversary. The Marsden Tract Bridge Replacement will be completed by skilled volunteers, with Eagle Scouts completing a secondary project at the same site. It is hoped that the bridge and the Scout project will both be completed in the spring, allowing visitors at this busy Park site to safely cross the canal. The current bridge has fallen into disrepair, with plywood covering multiple sections of the walking surface. The new bridge will be constructed beside the old one, so towpath access will not be affected. Through the Centennial Challenge Program, the National Park Service has selected more than 100 projects nationwide – including two at C&O Canal National Historical Park – to leverage a $10 million Congressional appropriation with $15.9 million matching funds from more than 90 partner organizations. These projects will improve visitor services, support outreach to new audiences, and strengthen partnerships to reinvigorate national parks, and forge connections to new communities.